Following up on last week’s post on structures of the E. coli Cascade complex, I just realized that I missed Blake Wiedenheft‘s structure in Science. Blake determined the original Cascade cryoEM envelope (at 8Å no less! ), so it’s quite nice that his group also solved one of these beautiful crystal structures. It’s funny how high-impact structures sometimes come in waves. There seem to be many examples in the literature of long-awaited structures suddenly being cracked by multiple groups simultaneously. Is it game-changing technical advances, new biological insight, or just synchronicity bias? Genome-wide sgRNA libraries for knockout screening are all the rage, and researchers have very generously made them available on Addgene. But which one should you choose for your project? Data is always better than guesswork, and I’ve started looking at what’s out there in a relatively systematic way. Note that this is a work in progress, so results will probably change a bit, but the general gist will probably be similar. Also, details in scoring of guides is a controversial topic, so for now let’s discuss stick to big picture themes everyone can probably agree upon. 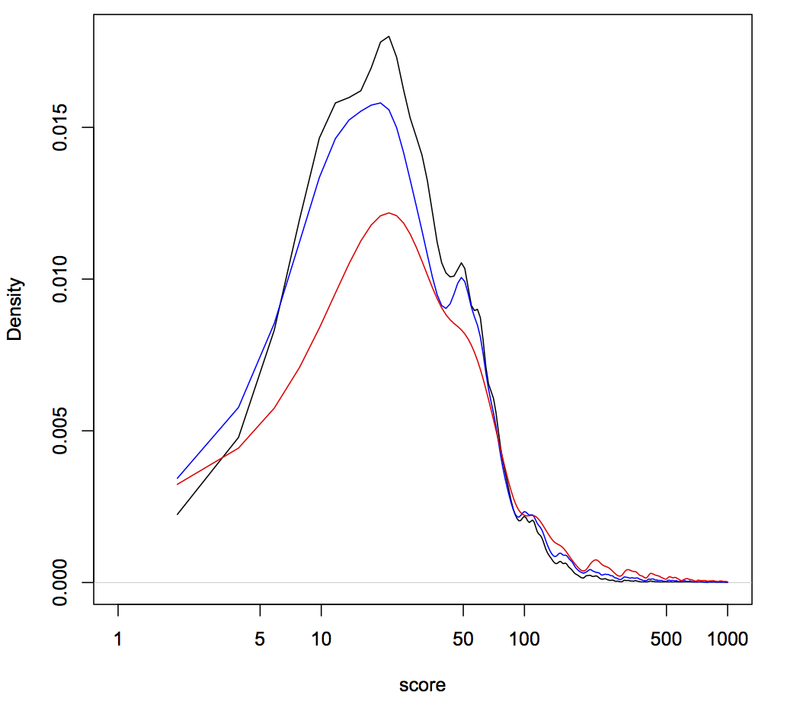 Below is a smoothed distribution of scores (lower is better, scale is arbitrary), based on several metrics for three different guide libraries related to two papers (score on the x-axis and frequency of that score on the y-axis). Why three libraries for two papers? Turns out one Addgene-deposited library isn’t the same as what’s tested in the paper. Thankfully the authors were very transparent and deposited both sets of sequences into Addgene. Kudos to them! The first thing to notice is that most guides score below 50. That’s good! It means those guides have only been penalized for relatively trivial things. Hence, the libraries are pretty good and most guides should be functional (a no-brainer, given the awesome papers on these libraries). The second thing to notice is that some libraries have a peak around a score of 50. That’s bad, because 50 is the penalty added to guides containing Pol III terminator sequences. These are likely to be useless guides, since they won’t even be fully transcribed, but at least they should be silent in the library. The third thing to notice are the jagged peaks above a score of ~100. These guides are relatively rare in the libraries, but are potentially scary. Guides can only get a score this high if they have likely off-target sequences that occur within coding regions. In fact, guides get +100 for each off-target coding region. So the saw-tooth pattern >200 represents guides in these libraries that could potentially knockout more than one gene other than the one target. Hence, when using these libraries it’s very important that your phenotype of interest occur with more than one guide (as stressed in the papers). Trusting just one guide could lead you very far astray due to off-target effects. The above isn’t mean to dissuade anyone from using these libraries. They’re an incredible and unprecedented resource and the originators have done the community a huge service by making them available for a nominal fee on Addgene. But I think all seasoned scientists know that it’s dangerous to treat things as a black box, and that looking under the hood never hurts. I’m sure library improvements will be a hot topic for some time to come and that can only be a good thing for people who want to use these for new biology. This week saw not one, but two papers with structures of the E. coli Cascade complex from the labs of Yanli Wang (Nature) and Scott Bailey (Science). Cascade is a bit like Cas9, in that it’s a bacterial immunity endonuclease targeted via CRISPR nucleic acid, but far more complex. While Cas9 is a single protein (and hence attractive for genome engineering), Cascade is 405 kDa split over 11 separate polypeptides and 5 open reading frames. In both structures, the crRNA is stretched out across the entire complex. The structure from Bailey’s group also has ssDNA bound, and while it generally follows the path of the crRNA, kinking and base flipping allows the pairing to severely underwind into a ribbon. As is often the case in a large, complex structure like this, there are all kinds of exciting bits to poke into and look at to explain existing biochemical data. I’m looking forward to carefully reading both papers and playing with the structures when they’re released. Kudos to both groups! On a side note, these are huge ~ 3 A structures that also contain nucleic acid, yet both are refined to levels that would have been unthinkable just a few years ago: R/Rfrees of 22.5/29.9 and 20.7/16.4! Of course there’s more to structure quality (and a structure) than the R-stats. But still, it’s astounding. Decide what kind of targeting you want to do. Here we’re considering double-stranded cutting to make a knockout via introduction of an indel. Use one of many servers to find guide RNAs in the region you’d like to cut. For example, CRISPR-MIT, E-CRISP, or CHOPCHOP. Which tool you choose is mostly personal preference, and each has their own model for scoring guide RNAs. Each target site will either be ~23 bases ending in “GG” (guide binds Crick strand) or ~23 bases starting in “CC” (guide binds Watson strand). The protospacer adjacent motif (“PAM”) refers to those last or first three bases and is present in the DNA you’re targeting but should not be used in the guide RNA. Hence, the guide RNA itself will be ~20 bases and lack a PAM. SpyCas9 can also use “AG” (Watson “CT“) as a PAM, but not as efficiently. The exact length of the guide doesn’t seem to matter very much; anything from 17-27 bases (remember, guides don’t include the PAM) seems basically OK (with some qualifiers). Choosing a guide Now you have a (possibly very long) list of potential guides. Each one has an associated score. How do you choose which one to use? Here’s a semi-ordered list of factors to consider, from most to least important. Consider these qualitative, rather than a quantitative score. Guides should be perfectly complementary to the region you want to target in the 8-12 bases closest to the PAM. Never choose a guide that has any significant off-target sites (perfect match for the 8-12 bases closest to the PAM) in a coding of the genome. Avoid sequences with significant secondary structure (The Vienna web server is a great place to check this). You should also avoid guides that disrupt the secondary structure of the 3′ constant region (the most common constant region sequence is "GUUUUAGAGCUAGAAAUAGCAAGUUAAAAUAAGGCUAGUCCGUUAUCAACUUGAAAAAGUGGCACCGAGUCGGUGCUUUUUU"). GC content should be between ~ 30-80%, the higher the better (but not too high!). Some groups have shown that U‘s are disfavored in the -1, -2, and -4 position (counting back from the first base of the constant region). Other groups haven’t seen this. Your mileage may vary. Prefer guides in DNAse hypersensitive regions (as annotated by ENCODE on the UCSC genome browser). This isn’t a necessity, but probably won’t hurt. It’s recently been shown that microhomology at the site of cutting can substantially increase the chance of getting an out-of-frame indel. This doesn’t affect cutting itself, but could help you get the knockout. Take the guide sequence you chose above and append the constant sequence “GUUUUAGAGCUAGAAAUAGCAAGUUAAAAUAAGGCUAGUCCGUUAUCAACUUGAAAAAGUGGCACCGAGUCGGUGCUUUUUU” to the 3′ end. Order oligos, anneal, and ligate. The above might seem like a lot, but it’s really not all that bad. You’ll quickly get a feel for what makes good vs bad guides. Since it’s so easy to test multiple guides, I always recommend making at least two guides per knockout you’d like to make. That way if one is a dud, you aren’t caught flat-footed. Obviously, there are many *s in the list above, denoting steps that might be a bit different if your application or parts differ from SpyCas9 making a double-strand break for the purposes of a knockout. The toolbox is always expanding, so options abound! But hopefully the above provides a general idea of how to get started. Do you have another neat trick to share? Did I miss something important? Want to expound on the best way to make a CRISPRi guide (a whole other ball of wax)? Feel free to leave a comment!